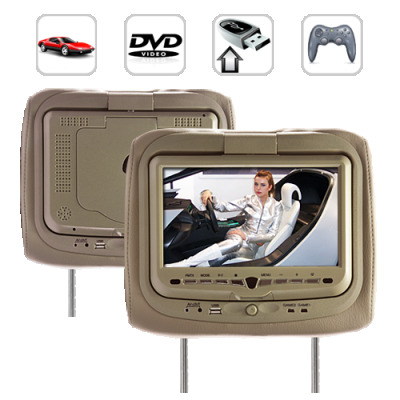 Successfully Added 9 Inch Headrest DVD Player + Gaming System + FM Transmitter (Tan Pair) to your Shopping Cart. A super way to transform your car into an entertainment powerhouse! Screen size, function-wise, and most importantly fun - this baby has it all! This 9 inch headrest region free DVD player comes with two separate gaming systems (wired and wireless) as well as FM transmitter output that effortlessly syncs with your car's audio system. A world of fun for you and your passengers without all the installation hassles! Easy peasy DVD! Perhaps you've considered adding DVD player functionality for the kids and other passengers at the back of the car to make those long trips a delightful experience every time. But the thought of extensive work behind your dashboard is a little too intimidating. Here's the perfect solution - DVD and multimedia and gaming on the go without all the technical fuss. This amazing 9 Inch Headrest monitor with built-in media player easily connects to your car battery and plays all types of multimedia disks such as DVD/VCD/CD (audio or MP3) in crystal clear 9 inch LCD splendor! What's more, insert a USB flash drive or SD memory card into the player, and experience movies, songs, or even view pictures in the following media formats: AVI (XVID codec), AVI (DIVX 5 codec), DIVX (version 5), MPEG 1/2, VOB, DAT, MP3, WMA, and JPEG. This 9 inch headrest DVD player has built-in speakers, but you can just as easily use the FM transmitter function to output audio to your FM radio and experience rich stereo sound through your car speakers. Question Of The Day: Do your kids like video games? Sorry let us rephrase that. Do you think having a built-in video game console would encourage them to shut their faces on those long trips to grandma's house? If your answer is yes, then this baby has not just one, but two separate gaming systems for them to keep busy with. Wired or wireless, they can experience the old-school thrill of classic 8-bit Nintendo games or go fast and furious with 32-bit modern games. Two games disks are included for their enjoyment. Whatever they choose, you'll be the one to benefit from all the relaxation that "kids on vids" brings! Finally, don't worry about installation. The struts by which the headrest unit is attached to your car seats can be adjusted to fit widths from 95 mm to 200 mm. Now you won't have to hear another "are we there yet?" on your next family trip with this great 9 inch LCD screen multimedia headrest DVD player from the one and only, often imitated, impossible to be duplicated, leader in direct from China wholesale electronics - Chinavasion. How can I play the audio using my car's stereo system? There are two ways. The first is to connect the white and red RCA cables to your cars stereo system. The second is to broadcast the audio wirelessly using the built-in FM transmitter. Can I connect other video devices to these DVD headrest monitors? Yes. As long as they use a standard RCA video connection then you can connect it to this device.